Herbert (1593–1633) was for eight years Public Orator at Cambridge, and cherished hopes of preferment at Court. For some reason this did not materialize and he entered the priesthood, therein to spend a mere three years before death cut him off. The Elizabethan age was by then well advanced and Herbert was a younger contemporary of Shakespeare. The English language was expanding and developing, and the Bible and the Prayer Book—known, through the Church, to all sorts and conditions of men—became an important catalyst in the process. Both what Herbert said (like most Anglicans he tried to steer a middle course between Romans and Puritans), and the way he said it, strongly appealed to the Christian agnostic (or ‘disappointed theist’) in Vaughan Williams. They were both preoccupied with that age-old conflict between God and World, Flesh and Spirit, Soul and Senses: it has many synonyms, and at least one Vaughan Williams masterpiece, Flos Campi, was born of it. 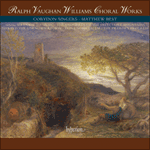 Vaughan Williams completed the Five Mystical Songs in 1911 and conducted the first performance in September of that year during the Three Choirs Festival in Worcester. Two years before, Walford Davies had produced a large work for the Hereford meeting by name of Noble Numbers, a setting of eleven poems by Herrick and six by Herbert. The latter included ‘The Call’ and ‘Let all the world’, both of which are set by Vaughan Williams in the Mystical Songs; their respective settings of ‘Let all the world’ (later done memorably also by George Dyson and William Walton), both spirited and vigorous, pick the key of D major, a Vaughan Williams favourite for this mood (cf. the Benedicite and the ‘Galliard of the Sons of the Morning’ in Job). Vaughan Williams did not care for Walford Davies, whose music is almost completely forgotten today; but he is a figure not without interest, not least in the way his discerning literary taste may have influenced his contemporaries. Of Vaughan Williams’s five settings, three—‘I got me flowers’, ‘The Call’ and ‘Let all the world’—reflect the hymnic stance and metre of the poems. The first-named has a definitely Pre-Raphaelite quality which takes us straight into the orbit of Debussy, a composer whose contribution to Vaughan Williams’s musical make-up is apt to be overlooked in favour of Ravel’s. ‘Easter’ is more elaborate in design and Michael Kennedy is surely right to ascribe its richness of orchestral detail to Elgarian prototypes. On the other hand, ‘Love bade me welcome’ looks both more inward and (in terms of Vaughan Williams’s own development) far further forward than the other songs. The rapt stillness at its centre—the Act, at which point in the traditionally Edenic key of E wordless voices intone the ‘O sacrum convivium’—is one of the great moments in Vaughan Williams, like the sighting of the New Jerusalem in Sancta Civitas. George Herbert (1593–1633) demeura huit ans Public Orator à Cambridge, non sans nourrir un espoir d’avancement à la cour. Mais, pour quelque raison, cet espoir fut déçu et Herbert fut ordonné prêtre, trois ans seulement avant de mourir. La période élisabéthaine était alors bien avancée et Herbert était le jeune contemporain de Shakespeare. La langue anglaise était, quant à elle, dans une phase de diffusion et de développement—un processus dans lequel la Bible et le Prayer Book (connus, à travers l’Église, de tous les hommes, quelle que soit leur condition) devinrent un important catalyseur. Ce que Herbert dit (comme la plupart des Anglicans, il tenta d’emprunter un juste chemin entre les catholiques et les puritains), et la manière dont il le dit, séduisit fortement l’agnostique chrétien (ou «théiste désappointé») sommeillant en Vaughan Williams. Les deux hommes étaient préoccupés par ce même conflit séculaire entre Dieu et le Verbe, entre la Chair et l’Esprit, l’Âme et la Raison—un conflit aux maints synonymes dont naquit au moins un chef-d’œuvre de Vaughan Williams, Flos Campi. 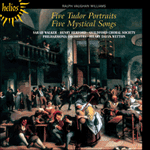 Achevés en 1911, les Five Mystical Songs furent créés, en septembre de cette même année, lors du Three Choirs Festival, à Worcester, sous la baguette de Vaughan Williams en personne. Deux ans auparavant, Walford Davies avait produit, pour la réunion de Hereford, une grande œuvre, Noble Numbers, mettant en musique onze poèmes de Herrick et six de Herbert. Parmi ces derniers figuraient «The Call» et «Let all the world», tous deux mis en musique par Vaughan Williams dans ses Mystical Songs. Les deux mises en musique de «Let all the world» pleines d’entrain et de vigueur, choisissent la tonalité de ré majeur, l’une des préférées de Vaughan Williams dans ce genre. Vaughan Williams ne se soucia pas de Walford Davies, dont la musique est presque totalement oubliée de nos jours; mais Davies, qui vaut surtout pour la manière dont ses fins goûts littéraires influencèrent ses contemporains, n’est pas pour autant une figure sans intérêt. Sur ces cinq mises en musique de Vaughan Williams, trois—«I got me flowers», «The Call» et «Let all the world»—reflètent la stance et le mètre hymniques des poèmes. «I got me flowers» recèle une qualité absolument préraphaélite qui nous entraîne droit dans l’orbite de Debussy, un compositeur dont la contribution au caractère musical de Vaughan Williams est aisément négligée, au profit de l’apport ravélien. «Easter» est de conception davantage élaborée et Michael Kennedy a assurément raison d’imputer la richesse de ses détails orchestraux aux prototypes elgariens. A contrario, «Love bade me welcome» est bien plus tourné vers l’intérieur et—pour ce qui est du développement même de Vaughan Williams vers l’avenir que les autres chants. 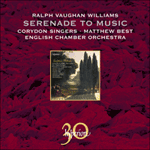 Sa profonde quiétude centrale—lorsque les voix, sine littera, entonnent, dans la tonalité traditionnellement édénique de mi, le «O sacrum convivium»—est l’un des grands moments de la musique de Vaughan Williams, comme la vision de la nouvelle Jérusalem dans Sancta Civitas. George Herbert (1593–1633) war acht Jahre lang offizieller Orator der Universität Cambridge und machte sich Hoffnungen auf eine Berufung an den Königshof. Die jedoch kam aus irgendeinem Grund nicht zustande; er wurde Priester, übte das Amt jedoch nur drei Jahre aus, ehe ihn der Tod ereilte. Das elisabethanische Zeitalter war bis dahin weit fortgeschritten, und Herbert war ein jüngerer Zeitgenosse Shakespeares. Die englische Sprache erweiterte und entwickelte sich, und die Bibel und das anglikanische Gebetbuch—die durch die Kirche Menschen jeglicher Herkunft und Stellung bekannt waren—dienten dabei als wichtiger Katalysator. Was Herbert zu sagen hatte (wie die meisten Anglikaner war er um einen Mittelweg zwischen den Anhängern Roms und den Puritanern bemüht) und wie er es sagte, sprach den christlichen Agnostiker (bzw. „enttäuschten Theisten“) in Vaughan Williams an. Beide interessierten sich sehr für den uralten Konflikt zwischen Gott und der Welt, Fleisch und Geist, Seele und sinnlichem Empfinden: Die Synonyme sind zahlreich, und mindestens ein Meisterwerk von Vaughan Williams—Flos Campi—ist ausschließlich daraus erwachsen. 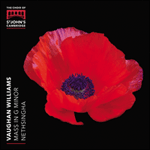 Vaughan Williams vollendete die Five Mystical Songs 1911 und dirigierte im September desselben Jahres die Uraufführung beim Three Choirs Festival in Worcester. Zwei Jahre zuvor hatte Walford Davies für das Festival, als es in Hereford stattfand, ein umfangreiches Werk mit dem Titel Noble Numbers geschaffen und dafür elf Gedichte von Robert Herrick und sechs von Herbert vertont. Unter den letztgenannten befanden sich „The Call“ und „Let all the world“, die Vaughan Williams beide in den Mystical Songs verarbeitet; ihre jeweiligen Vertonungen von „Let all the world“ (das später auch unvergeßlich von George Dyson und William Walton vertont wurde) sind lebendig und kraftvoll und wählen beide die Tonart D-Dur, die Vaughan Williams für diese Grundstimmung bevorzugt (zum Beispiel in Benedicite und der „Galliard of the Sons of the Morning“ in Job). Vaughan Williams hielt nicht viel von Walford Davies, dessen Musik heute fast völlig in Vergessenheit geraten ist; dabei ist er eine durchaus interessante Persönlichkeit, nicht zuletzt wegen der Art und Weise, wie sein anspruchsvoller literarischer Geschmack seine Zeitgenossen beeinflußt haben dürfte. 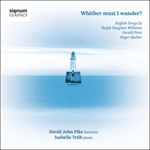 Von Vaughan Williams’ fünf Vertonungen spiegeln drei—„I got me flowers“, „The Call“ und „Let all the world“—den hymnischen Charakter und das Versmaß der Gedichte wider. Die erstgenannte hat eine eindeutig präraffaelitische Atmosphäre, die uns direkt in die Umlaufbahn Debussys versetzt, eines Komponisten, der mit seinem Beitrag zu Vaughan Williams’ musikalischer Grundausstattung leicht zugunsten von Ravel übersehen wird. „Easter“ ist vom Aufbau her kunstvoller, und Michael Kennedy hat sicher recht, seine Fülle orchestraler Details dem Vorbild Elgars zuzuschreiben. „Love bade me welcome“ ist dagegen mehr nach innen gerichtet und (unter dem Aspekt von Vaughan Williams’ persönlicher Entwicklung) wesentlich weiter fortgeschritten als die übrigen Lieder. Die verzückte Stille in seinem Zentrum—der Gnadenakt, ein Punkt, an dem in der traditionell paradiesischen Tonart E wortlose Stimmen das „O sacrum convivium“ intonieren—ist einer der ganz großen Momente bei Vaughan Williams, ähnlich dem Anblick des Neuen Jerusalem in Sancta Civitas. But Thou wast up by break of day. I, the unkind, ungrateful? Ah, my dear. Come, my Way, my Truth, my Life! Come, my Joy, my Love, my Heart! Antiphon (1911) brings the ardent George Herbert settings, Five Mystical Songs, to their conclusion, shifting to a more immediate, present, joyous realm than that traversed earlier. 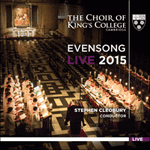 The organ’s introduction mounts from a pregnant murmur into an energetic pealing of bells. The musical evocation of bells is often heard in Vaughan Williams’s works, especially at moments of conclusion. As in real life, they issue a call to act—to gather, to respond. They function here to underscore the choral culmination (where in previous songs the choir is limited to supporting a baritone’s solos). Voices and bells thus work self-consciously to enact the demands of the text—‘Let all the world in every corner sing’.